The victim of a series of break-ins says he has been threatened with arrest for putting a banner on the front of his house in in South Croydon, London, offering a reward for information about the thief "dead or alive". Sebastian Stephenson said the banner was "banter" designed to "whip up a bit of interest" after his van was broken into several times over a period of as many months, costing him nearly £5,000 in stolen tools. He said he had no choice but to turn detective after police told him the investigation was closed, despite being provided with clear CCTV footage of one of the break-ins. Mr Stephenson, project manager at Thornton Heath-based Diligent Developments, said: "When the police said they weren't going to do anything I had to take matters into my own hands. This morning a police inspector went to my house looking to arrest me for inciting public disorder because of the banner. "I said I just want information whether [the thief] be dead or whether he be alive. That doesn't mean I'm telling people to go out and kill him. I'm not inciting violence, it's entertainment, it's banter. I'm sure the inspector knows it's just a bit of banter to whip up a bit of interest but he would rather use his resources to arrest a victim of crime who has been forced to take matters into his own hands than the criminal himself." CCTV footage shows a young man gaining entry a Ford Transit van parked on Mr Stephenson's driveway in Farnborough Avenue, Selsdon, at 4.39am on May 23. He can be seen carefully lifting out tools worth £2,000 before walking away with them. Mr Stephenson, who had recently bought the tools to replace another set taken from one of his vans in February, believes the thief used a master key to open the door. "After the incident in May I looked back at the footage from the camera on my house and saw a gentleman using a key to open my van," he said. "You can tell he knew what he was doing from the way he took the stuff. He didn't open any of the boxes because he knew what he was taking. I'm sure he took the tools in February and had come back for more. 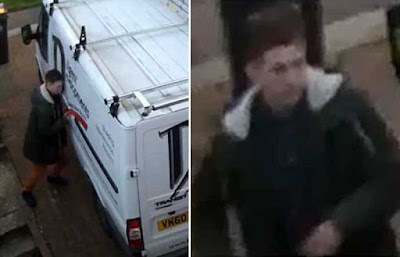 It's the fourth time one of vans has been broken into in as many months. I called the cops and explained what happened, that I had caught the guy red-handed and I had a video. They said they would send the video to the national database and the case would be closed. I said that's no good. This guy is a burglar. He's hit me for nearly £5,000. My missus is scared of being in the house alone because there is someone targeting the property. The least they could do is put leaflets out warning people there is a thief in the area, this is people's livelihoods we're talking about." Mr Stephenson decided to post the video online on Saturday. "I've got people sending me images of CCTV they have taken of this guy stealing from their vehicles," he said. "They told me he hit them in Gravel Hill [in Addington] and in South Croydon. Another guy has said he knows the bloke because he used to work in the prison canteen at HMP Highdown." Mr Stephenson also erected a banner on the front of his house which reads "Wanted! Dead of Alive. Do you know this thief. 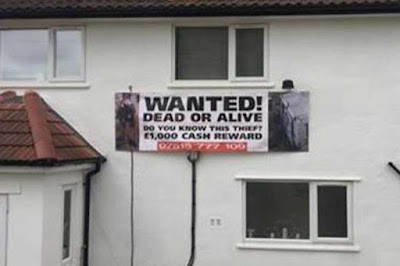 £1,000 cash reward". He says he has no intention of taking it down. "Why should I? I haven't done anything wrong," he said. "I'm getting results so [the police] are embarrassed and they want to arrest me. It's laughable. I'm going to continue to try to find this guy and, when I do, I'm going to do a citizen's arrest and take him to the station myself. People shouldn't be in fear of enforcing the law. I shouldn't have to do it myself but I have no confidence in the police."